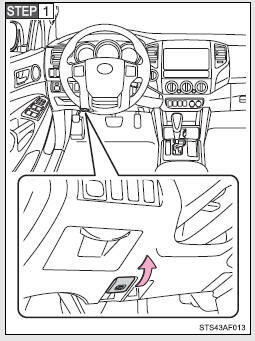 Release the lock from the inside of the vehicle to open the hood. Pull the hood release lever. Pull up the hood catch lever and lift the hood. Hold the hood open by inserting the supporting rod into the slot. Check that the hood is fully closed and locked. If the hood is not locked properly, it may open while the vehicle is in motion and cause an accident, which may result in death or serious injury. 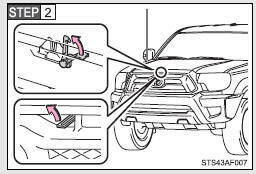 Make sure the rod supports the hood securely from falling down on to your head or body. 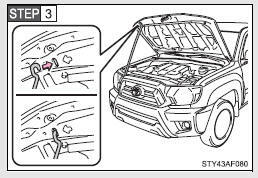 Be sure to return the support rod to its clip before closing the hood. Closing the hood with the support rod up could cause the hood to bend.